On this glorious afternoon at Upjohn Park, in the 100th running of the event, Maeve Goehner and Nicola Hogg won silver and bronze medals in the under 12 girls 1.5k event, while Daniel Francken picked up an individual bronze in the under 18 boys’ 5k. The full strength under 12 girls A won their much anticipated gold, while the B team came 4th. The under 14 girls with a little help from Nicola Hogg, won another bronze. The under 14 boys won silver while the B team with Cam Gorman and Matthew Hogg running up was pushed into 4th place by a mixed Sutherland team. Our under 16 boys came second with Jack Mills, Liam Gorman, Will Law and the invincible Harry Prowse! Here we can see Jack Mills, Liam Gorman and Will Law. In the 5k event, the under 18 boys won gold again while the under 20 boys, well David and Gus with the ever-helpful, and team-spirited Dan Cooper and Becky Rogers, picked up a silver. Hannah Rasmussen was unfortunately taken ill very soon after the start of the race and had to pull out. In the mean time, Bethany Halmy and Jess Vernon both ran well enough to earn State Selection for Albany. Finally, a big well done to Alice Wensing - who is only 12 – who stepped up to run in the 5k to help the under 20 girls. Here we can just about see Gus Wong, Bethany Halmy, Adam Halmy, Daniel Francken, Becky Rogers, David Gardiner and Hannah Rasmussen. · The under 12 boys came an excellent third considering most of them are at the young end. · The under 12 girls A came a very solid second to the invincible St George team, while the B team was 5th. · The under 14 boys A came second, while the B team fourth, so well done boys!!! · The under 14 girls came third. This age group had help from the under 12s throughout the season, especially from Hannah Lovlin, so thank you. · The under 16 boys, without the injured Josh Phiilips, came second, which was excellent. · The under 16 girls came 7th with their single appearance at the Road Relays. · The under 18 boys won their competition by 55 points, winning gold twice. They are undoubtedly the team of the season. · The under 18 girls came 4th with their three appearances. 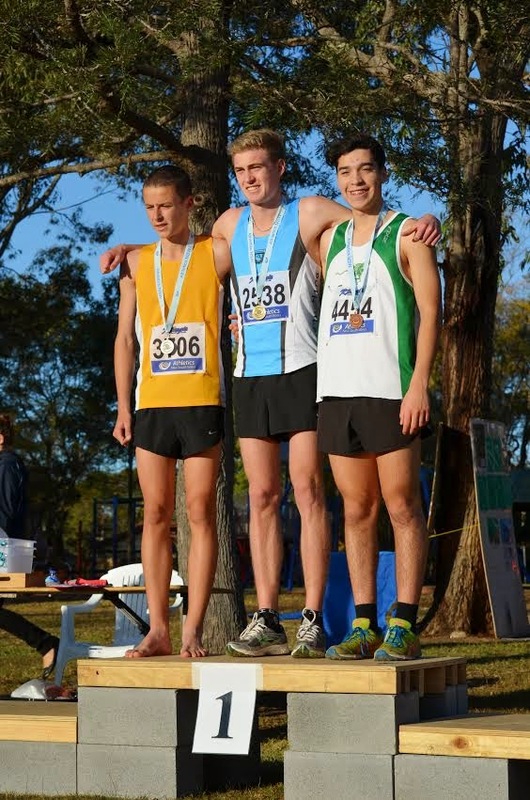 · The under 20 boys were always going to struggle with teams given all three of them are in year 12. But with more than a little help, they came second, so well done. · Despite a number of mishaps, the under 20 girls came second, with probably the tightest margin - the top three teams were separated by a mere 15 points.